Beautiful mixed fabrics for just about anything, clothing, props, sheets, etc. Created with attention to details, countless hours of testing, and rendered with SV’s INTENSITY Iray Lights. This is also a Merchant Resource, please see ReadMe.txt for more information. Easily change colors and effects by adjusting the Iray Shader sliders and diffuse colors. Many shaders have been left grey scale/black but can be easily changed to whatever color you wish. Main promo is gold lace, not included, simply use the red lace and change color to a shade of gold, its that simple! Presented as a “starting point” for endless combinations and adjustments for the perfect fabric. 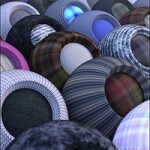 Shader set ups are set to match the fabric they are created for.